How Do Cigarettes Cause Cancer? Among the 7,000 or so different chemicals in cigarette smoke, more than 70 are known to be carcinogens. Most carcinogens promote cancer by damaging DNA and causing mutations. Illustration by Wenjing Wu. Scientists are learning how the carcinogens in cigarette smoke interact with DNA to promote cancer. This molecular information complements the well-known epidemiological links between smoking and cancer. That cigarettes cause cancer is no secret. In addition to about 85% of lung cancers, cigarette smoking is responsible for a large fraction of bladder, head and neck, and esophageal cancers. Scientists have known that smoking causes cancer since at least the 1940s, when epidemiological studies showed a clear link between smoking and lung cancer. Experiments conducted in the 1950s confirmed that the chemicals in cigarette smoke could cause cancer in mice. By the time the US Surgeon General issued his warning against smoking in 1964, there was overwhelming evidence that cigarettes were deadly. But in the years since, what have scientists learned about how cigarettes cause cancer? And does this knowledge open up new avenues for treatment and prevention? The first clues about how cigarette smoke causes cancer came in the 1960s. 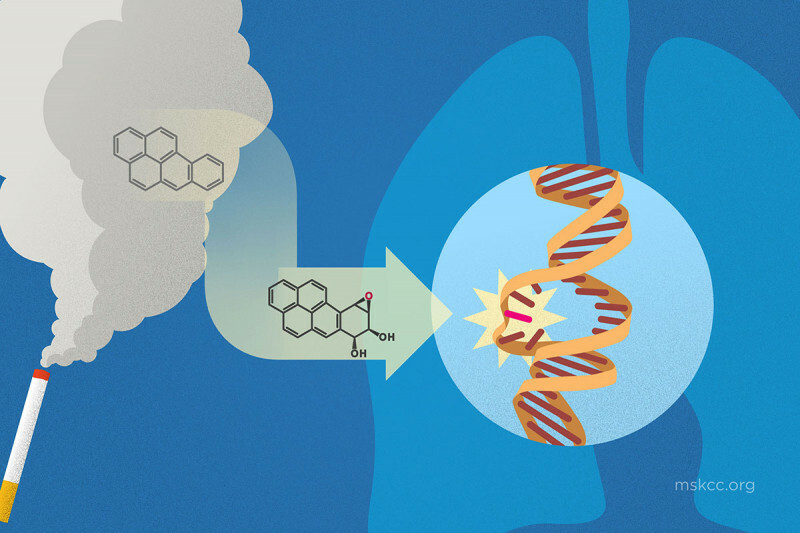 That’s when scientists found that molecules suspected of being carcinogens could bind to DNA. Since DNA is the blueprint for life, anything that corrupts that blueprint is destined to cause trouble. Among the 7,000 or so different chemicals in cigarette smoke, more than 70 are known to be carcinogens. The most well-studied of these is benzo[a]pyrene (BP). BP is one of several ring-shaped chemicals called polycyclic aromatic hydrocarbons that are produced when organic matter, such as a tobacco leaf, is burned. When it enters the body, BP becomes a powerful DNA disruptor, producing mutations that can lead to cancer. BP isn’t found only in cigarette smoke. It’s also found in car exhaust, charred meat, coal tar, and soot. This last example explains 18th-century doctor Percivall Pott’s famous observation that London chimney sweeps were prone to developing scrotum cancer; soot collected there, and soap was a rare commodity. Like most foreign chemicals taken into the body, BP is processed by enzymes to make it water-soluble. This change allows the kidneys to excrete the foreign chemical in urine. These water-soluble forms of BP, called epoxides, are especially good at binding to DNA. They form bulky attachments, or adducts, that bend DNA out of shape. Sloan Kettering Institute structural biologist Dinshaw Patel did some of the early studies that showed how this happens at the level of individual atoms. Cells can remove some of these adducts easily with specialized DNA repair enzymes. But occasionally, the adducts remain stuck to DNA and lead to a cascade of problems. The lungs, mouth, and bladder are common sites of smoking-induced cancers because this is where the epoxides are made or where they travel. By studying the DNA-carcinogen adducts at the atomic scale, scientists have learned that they preferentially form at guanine bases in DNA. Normally, a guanine base pairs with a cytosine base in the DNA helix. But when DNA with an adduct is replicated, the enzymes that do the copying tend to put an adenine base opposite this guanine, rather than the usual cytosine. This leads to what’s called a G-to-T transversion. You can think of a transversion as a kind of reading error. Say a speck of dirt fell on the page of the book you were reading and made an F look like a P. Instead of “Fine,” you read “Pine.” This changes the meaning of the sentence. Different types of environmental factors cause different types of mutations. Ultraviolet light, for example, produces CC to TT mutations. These distinct changes may help identify which treatments are suited to a particular person. Among the genes commonly mutated in lung cancer is TP53, which makes a protein called a tumor suppressor. 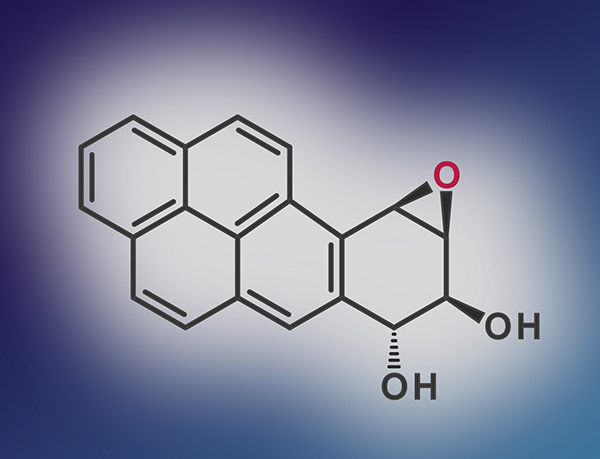 These proteins provide a built-in defense against cancer. 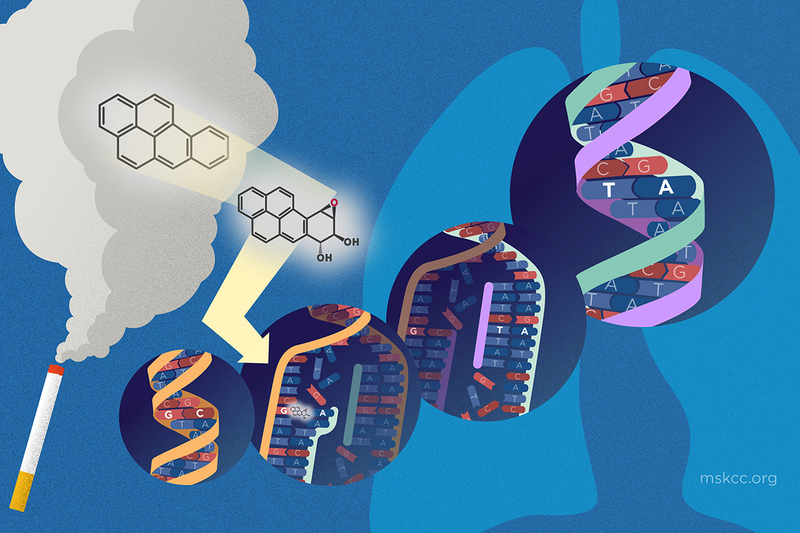 Scientists have shown that the sites of mutation in the TP53 gene found mostly commonly in people with lung cancer match the sites of adduct formation. This is strong evidence that the DNA adducts are the source of mutations in smoking-related cancers. Carcinogens in cigarette smoke cause mispairing of a G base with an A base in DNA. When this DNA is replicated, the new copy has a T where the old copy had a G, called a G-to-T transversion. Illustration by Wenjing Wu. Many of the carcinogens in tobacco would be produced regardless of what organic material a person smoked — be it dandelions or marijuana. Others are specific to tobacco. This explains why chewing tobacco and snuff are carcinogenic even though they aren’t burned. One broad class of tobacco-specific carcinogens is nitrosamines. These chemicals are derived from nicotine. They form in the tobacco plant during curing. Like polycyclic aromatic hydrocarbons, they can bind to DNA and promote inaccurate DNA copying. According to Stephen Hecht, a tobacco expert at the University of Minnesota, the carcinogenic potential of chewing tobacco and snuff are likely due to the tobacco-specific nitrosamines in tobacco products. He says that marijuana smoking has not been linked to cancer, possibly because people don’t smoke enough of it. Nicotine itself does not damage DNA. People using nicotine-replacement patches and other smokeless nicotine delivery systems, like e-cigarettes, are not known to be at a higher risk of developing cancer. But nicotine is highly addictive. That’s why many people find it so hard to stop smoking once they start. If you are looking to quit, MSK has several support groups and other programs that can help.